There has been a disturbing increase in the use over the last ten years of synthetic drugs known as new psychoactive substances, also known as legal highs due to their uncertain standing in the eyes of the law. At DetoxPlus we find ourselves helping addicts to break free from these drugs more and more. Legal highs are not only extremely dangerous, but they can also take over a person’s life. Those receiving treatment for a legal highs addiction may be familiar with the origins of psychoactive substances, otherwise known as designer drugs or legal highs. Created as a by-product of experimenting with the chemical make-up of pre-existing drugs and containing elements of both legal and illegal substances, designed to replicate the effects of narcotics like cannabis, heroin, amphetamines, cocaine, ecstasy and LSD. If you are concerned your addiction to legal highs has become a problem, then treatment is available. DetoxPlus is in the foreground of the latest drug rehabilitation therapies in the country, and we can help. Legal highs are usually produced in secret locations and underground or homemade laboratories. They are invariably sold online or in what is known as ‘head shops’, and often purchased as part of drug paraphernalia. The substances were designated unfit for human consumption and were widely sold as bath salts, incense, and potpourri or plant food. Those either experimenting with legal highs or battling an addiction requiring treatment, can purchase the substance in various forms, such as powder, pills, capsules and perforated tabs. There have also been instances of people taking smoking mixtures and injecting legal highs, which may call for hospital treatment. 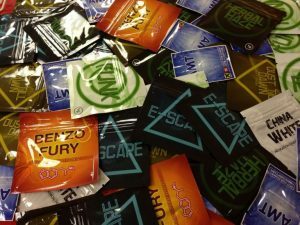 Legal highs, often called club drugs, generally come in three main categories, synthetic cannabinoids and synthetic stimulants, which were regularly sold as bath salts but replicates methamphetamines, ecstasy and cocaine. There are many different types of legal highs, which could lead to addiction, although the effects are eliminated with treatment. Legal highs are produced in illegal laboratories which makes measuring their toxicity and potency, as well as examining their ingredients extremely difficulty. Those struggling with addiction, or wishing to sample legal highs, should be aware of the change in legislation. The Psychoactive Substances Act 2016 came into law on the 26th of May of that year. It states that the production, distribution, sale and supply of legal highs is a criminal offence, and if convicted, sentencing can be up to seven years in prison. The Government are challenged to enforce legislation by the basic fact that new synthetic drugs are being introduced to the market every week. People receiving treatment for legal highs addiction may have taken synthetic stimulants such as Flakka, Bubble, M-Cat, Miaow Miaow, or Mephedrone. There are synthetic cannabinoids like Annihilation, Black Mamba and Spice, as well as synthetic hallucinogens, including foxy methoxy, 25I-NBOMe, Benzo Fury and N-Bomb. Those with a legal highs addiction, alongside other psychoactive substances, can experience a wide range of effects. Many which may require treatment. Stimulants can make you feel energised and bring on euphoria, in the vein of ecstasy, cocaine or amphetamines, which can result in addiction. Sedatives such as methoxetamine often referred to as downers, can also make you feel euphoric, as well as drowsy or relaxed. Their effects are similar to benzodiazepines, like Valium or diazepam. There are also psychedelic legal highs such as NBOMe, otherwise known as hallucinogens which can change a person’s perception and can indeed make them hallucinate, hence the name. They behave like methoxetamine, ketamine, magic mushrooms and LSD. Those in need of treatment for an addiction to Legal Highs may also be taking synthetic cannabinoids like Black Mamba or Spice, with effects comparable to cannabis. They can also make a person feel energised and euphoric and bring on feelings of relaxation and intoxication, as well as altering someone’s perception. These are among the numerous widely known symptoms of using so-called legal highs. Many people do not seem to realise that psychoactive substances can have the same properties as other drugs including cocaine, cannabis and amphetamines, which can end in addiction, necessitating treatment. The drug is invariably taken recreationally, but long-term use could possibly bring about cravings or a compulsion to continue. Users may also fear undergoing withdrawal as part of their treatment which can be especially true if the drug contains sedatives or stimulants. This can cause a great deal of uneasiness for a person coming off drugs like downers, which can bring about major symptoms. The physical signs of withdrawal can be markedly hazardous for long time users who may be forced to undergo treatment. These are among the many risks of developing an addiction to legal highs. Those caught in the grip of legal highs addiction and considering treatment should know that, in most of the cases, the chemicals used in the creation of legal highs have not been through safety tests, meaning there is no way of knowing what the drugs contain and how it could potentially affect you. In many instances, the substances can contribute to seizures, paranoia and may cause users to fall into a coma, necessitating hospital treatment. They may even result in sudden death. The dangers of legal highs are enhanced when mixed with alcohol or any other psychoactive substance, as well as being administered through injection. For those running the risk of addiction, or especially if using for the first-time, the consequences of taking legal highs may be severe and could end up with the user requiring treatment. Users may have a false belief that the substance is safe, making you open to several health risks such as a loss of inhibitions or excessive risk-taking activities. The drug also has several hazardous side effects, ranging from mood swings, insomnia, overheating or hyperthermia to high blood pressure. There is a heightened chance of addiction, psychosis and even heart failure or dangerous respiratory issues, among other problems. Are you worried about your legal highs addiction, and you would like to get clean? The first step in getting treatment is contacting our trained counsellors to evaluate the seriousness of the person’s problem. We at DetoxPlus have our finger on the pulse of therapy, where you can benefit from our all-embracing rehabilitation programme, employing the most up to date methods to assist you. Those dealing with addiction can experience our unique rehab treatment, where people undergoing treatment can have a therapy detox to wash the Legal High out of their body. If you choose to visit one of our clinics for treatment, you will be under the watchful eye of highly trained staff, experts and consultant psychiatrists, during detox. Once our clinics have handled the physical side of addiction, patients then move to a comprehensive rehabilitation treatment. It is comprised of a thorough therapeutic programme, covering the physical, psychiatric or spiritual side of addiction, where they will get to the root of the addiction by focusing on physical or psychological health as part of the treatment. They will also integrate an all-encompassing mental and physical wellness programme in the treatment as well as in-depth holistic therapies to help you battle your dependency. If you are living with a legal highs addiction and you wish to remove them from your life for good, then come to DetoxPlus. You can depend on us. We are always on the frontline of the latest addiction treatment.